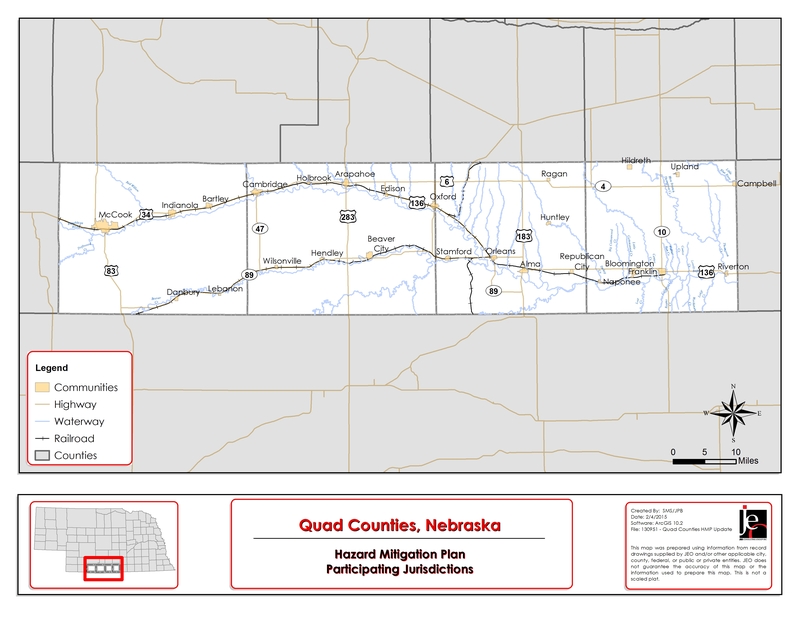 The primary objective of this project is to update the 2010 Multi-Jurisdictional Hazard Mitigation Plan (HMP) for the Franklin, Furnas, Harlan, and Red Willow Counties (Quad Counties). A Hazard Mitigation Plan is a community-guided document that identifies both vulnerability to natural and man-made hazards, and mitigation measures to reduce or eliminate this vulnerability. Hazard mitigation plans are a requirement of the Disaster Mitigation Act of 2000, administered by the Federal Emergency Management Agency (FEMA). Once a community, NRD, or county is part of a plan, they become eligible to apply for pre- and post-disaster mitigation grants, which are available on an annual basis as appropriated by congress. These federal grants allow for up to a 75% cost share for a wide variety of projects listed in the plan. This hazard mitigation plan update was funded by a FEMA planning grant. The cost is shared 75% through federal funding and 25% through a local match. For this plan update, the Quad Counties are providing the 25% local match. The Quad Counties Multi-Jurisdictional Hazard Mitigation Plan has received “approval upon local adoption” by the Federal Emergency Management Agency (FEMA). At this point, each plan participant must adopt the plan at the local level. If you have any questions, or would like to see an example plan adoption resolution, please contact Phil Luebbert.